Diversity & Comics launched the Jawbreakers crowdfunding campaign on April 9th, 2018. Within the first day, it had already exceeded its initial goal of $5,000, and as of this writing, it’s reached $235,244. For a comic book published in the current year, that isn’t part of some Lootcrate promotional deal, this is an amazing event to witness. Rarely does the comic book industry see this sort of interest in any single title. If the book is fun to read and interest holds after its release, then it will help to bring more paying customers back the comic book market. After careful consideration, it is the decision of Antarctic Press to not release the comic series Jawbreakers. Antarctic Press is a staunch believer in Creator’s Rights and giving creators a chance to showcase their creation and allowing that creation to be judged on its merits. Many forces, many of them should be viewed with great trepidation about how our society acts, have led us to this decision. We do not take this decision lightly as we do believe that there should be separation between “ART” and the “ARTIST” and that separation has been blurred in our decision. We appreciate all our supporters and detractors in this process. 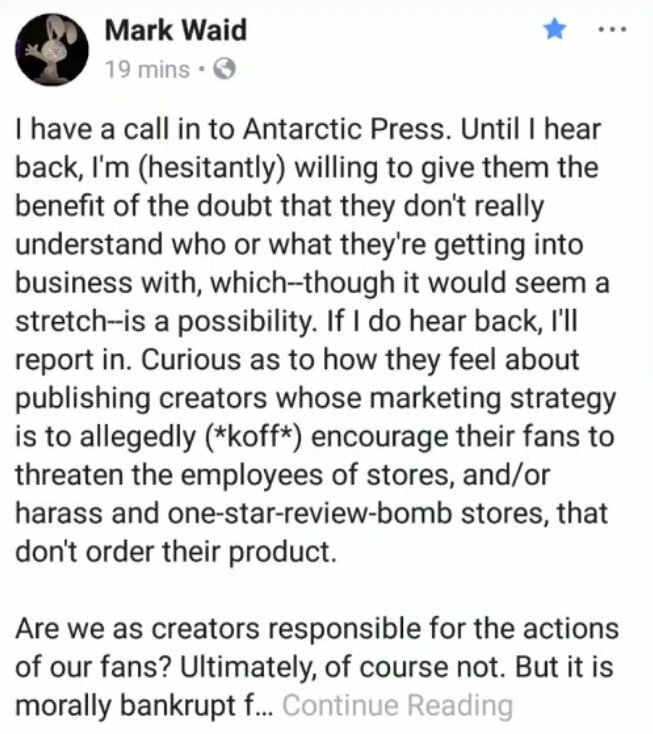 Prior to Antarctic Press’ announcement, Mark Waid made a post on Facebook (now deleted,) in which he says that he called Antarctic Press. He claimed that D&C was threatening store employees, when in reality all D&C did was inform his customers which stores refused to stock Jawbreakers. His worst “crime” was publishing the addresses of businesses which are available to the public. Since then, Mark Waid has deleted all social media accounts. There’s a rumor on 4chan’s /co/ board (reposted on r/KotakuInAction here) that C. B. Cebulski, Editor in Chief of Marvel Comics, ordered him to go silent on social media or they’ll drop him from the company. This rumor is currently unconfirmed, so take it with a grain of salt. 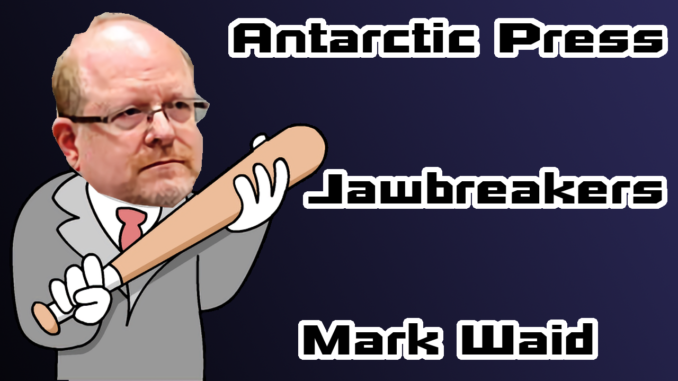 In response to this rumor, Antarctic Press issued a statement on Twitter in which they confirmed that Mark Waid sent them a phone call, but they denied contacting C. B. Cebulski or anyone at Marvel Comics. I have come to doubt the truth of this statement, especially the last sentence. When Andrew Smit‏ said that no one believes them, they responded by implying that he was a sockpuppet account. Regardless, the book is still going into production, but without Antarctic Press, it will be harder to get the book into stores. This means that potential readers will be less likely to discover the book. Sure, there’s still digital sales, but D&C’s viewers aren’t ebook customers. Most them them would rather have the physical book, and the few that might buy it digitally probably won’t buy too many other comics, so it wont get recommended under other titles. Since the digital marketplace is built to promote only titles which have already proven to be profitable, most people probably won’t come across the book unless they’re specifically looking for it. By dropping the book, Antarctic Press has made it harder for Jawbreakers to find further success beyond its initial crowdfunding campaign. That said, it already has made quite a lot of money, so as long as the funds aren’t mismanaged, the book should prove successful. If word of mouth is strong, it could easily break containment and go on to be a healthy title in the comic book market. D&C hates digital comics and has refused to release Jawbreakers digitally, partly to drive sales to shops. Also, he’s decided to start his own publishing company in response to being dropped.